In most places summer means longer sunlight, and this can be problematic for water features and ponds due to the growth of algae. While a degree of sunlight is healthy and necessary for fish, too much exposure to it can cause a buildup of algae which will reduce the health of the environment. Fish that have too much exposure to sunlight are also subject to sunburn. Pond scum is another common problem which results from algae, and the likelihood of it happening is greatest during the summer months. Chemicals can be used to keep algae down, but to get rid of it permanently, the water feature will need to be cleaned and shade must be provided to keep the water temperature manageable. 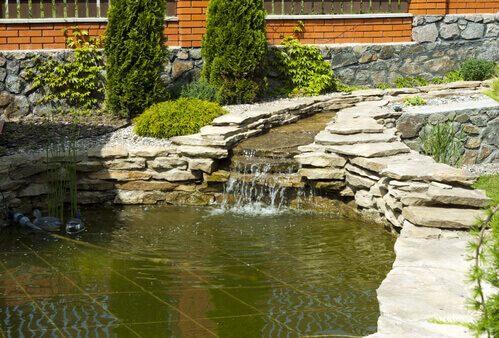 The water within a water feature or pond must be topped up from time to time. This can be done once a week during summer, unless you’re receiving lots of rain. Those that keep fish should add water from a primary supply, but this should always be done in lower amounts because the water may be cold and the fish need time to acclimate to it. During summer leaves, flowers, grass and debris will fall into the water, and if they’re not removed the water quality will decline and become discolored. Additionally, your pipes may become blocked, so you will need to use your hands or a net to physically remove any debris and then use a compost heap to store it. Things to watch for in your water feature include water marks in areas with hard water, as well as grime. From time to time it will be necessary to completely cleanse the feature so that the water will retain its crystal clear appearance. To do this, you will need to make sure the water feature is totally drained and then refilled once the cleaning is complete. Some water features can be jet washed but for those that are delicate it may be better to scrub them with a gentler solution. One thing that you should always pay attention to is your pumps. The pumps should receive periodic cleaning so that they continue to operate efficiently. This will ensure that the water quality remains pristine at all times. Any fish that live in the water should have an area they can go to for shade during sunny days. This could come in the form of aquatic plants such as water lilies, or shelters which can be placed underwater where the fish can seek refuge to avoid the sun. Following these tips will ensure your pond remains healthy and vibrant.